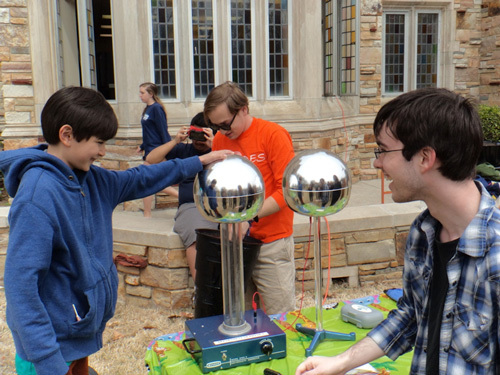 Rhodes College SPS members with the Van de Graaf generator at the annual "Rites to Play" carnival. This year the Rhodes College chapter of SPS continued its previous efforts to reach out to the Memphis community (and further! ), in particular by focusing on improving the quality of its events. In addition to large-scale outreach opportunities, Rhodes maintained weekly interaction with several local schools and presented at a few recurring smaller scale events. Annual events such as a pumpkin drop and presentations at Rhodes’ Rites to Play were balanced with monthly astronomy open houses and a few new events, including Physics Field Day and participation in the Global Space Balloon Challenge.